Product prices and availability are accurate as of 2019-04-19 01:16:49 UTC and are subject to change. Any price and availability information displayed on http://www.amazon.com/ at the time of purchase will apply to the purchase of this product. Lockdown Strips is a veteran owned family business that is dedicated first and foremost to student safety. 1. Place the Lockdown Magnetic Strip on the Metal frame of a door, covering the strike plate. 3. Allow the door to close. You will be able to simply pull or push the door open. This allows students to easily come and go. 4. 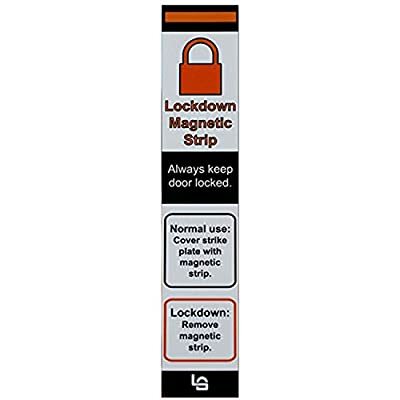 When a lockdown is initiated: open the door slightly to remove the lockdown magnetic strip. 5. When the door closes it will already be locked. SPEED - Extremely fast classroom lockdown method for doors with steel frames. Magnet adheres to the metal door frame. SECURITY - Keep your building prepared. Keep classroom and office doors "lockdown-ready" at all times. SIMPLICITY - No fumbling for keys during an emergency or intruder situation. Substitutes that may not have keys can also ensure their door is locked. AWARENESS - A walk down the hall will easily let you identify classrooms and offices as lockdown ready. TRUST - Lockdown Strips is a veteran owned business that puts student safety first. Lockdown Strips are designed in America and have been used in many school districts.